Learn more about the Nieman lab’s Fuego resource, an app that tracks those links the future-of-journalism crowd is talking about most on Twitter. Many have joined the conversation: last fall, the lab’s website (www.niemanLab.org) welcomed its five-millionth page-view. Visitors can learn how the St. Louis Beacon recently used a new Apple app, iBooks Author, to compile its articles, photographs, and video on 2011’s record floods into Meandering Mississippi, a new e-book. Or trace the way Mignon Fogarty, a science and technical writer, had an epiphany in a beachfront café in Santa Cruz, California, and parlayed her hobby—producing weekly Grammar Girl podcasts on usage and syntax—into a growing media network. They can access a detailed analysis of how Oslo-based Schibsted, the world’s eighth-largest news organization (just behind the New York Times Company), operates in 28 countries and extracts 36 percent of its revenue from digital sources—more than three times the rate of an average newspaper. The latter concludes a three-part series by Ken Doctor on European business models for the digital news industry, which in some ways are far ahead of those of North America. The lab has a rare status: a news operation running within the University that is not devoted to Harvard news. Typically that happens at universities with journalism schools—which Harvard is not. But it does have the 75-year-old Nieman Foundation, which enables working journalists to take a fellowship year in academia. The Nieman endowment funds most of the lab’s budget; it has also received grants from the Knight Foundation and the Carnegie Corporation. Such support allows the lab to operate as a news site sans ads, meaning “We don’t have to artificially pump up page-view numbers to try to squeeze a little more money out of advertisers,” Benton says. 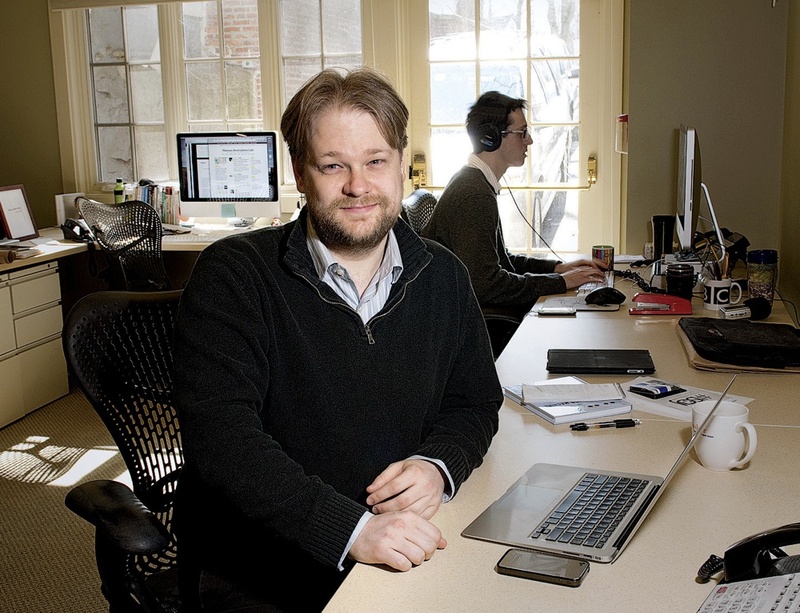 The lab germinated in the mind of former Nieman curator Bob Giles in 2006, when he began thinking that the foundation “needed to become a significant participant in the emerging conversation on the future of news. We were getting fellows who wanted to know what their future was.” The foundation’s advisory board agreed with that premise and, working with him, came up with the idea of a website. Globally so: Benton also travels a good deal to get the word out, giving talks around the United States and in places like São Paulo, Berlin, Paris, and Hong Kong in recent years. The lab keeps in touch with cognate entities like the Shor­enstein Center for the Press, Politics, and Public Policy at Harvard Kennedy School and MIT’s Center for Civic Media. It hosts monthly happy hours that bring together “the nerdiest elements” of Boston’s journalism community, says Benton, with a grin. Three staff writers, plus many freelancers, do the lab’s reporting, posting new material five days a week; the day’s first tweet goes out around 9 a.m. Users also can access its aggregation project, Fuego (“fire” in Spanish), launched last year—a “heat-seeking Twitter bot.” Fuego algorithmically determines what part of the Twitter world is talking about the future of journalism, and tracks and ranks the stories that these people are discussing every 30 minutes. The cyber-landscape also means that a YouTube video can go viral without any gatekeeper involved: Web users simply share it laterally. That’s true for information generally, he adds, so “People are sifting for editorial gold but don’t have time to do all the work” of winnowing through the tweets, blogs, and posts out there. Fuego attempts to cut through the noise to help those prospecting for knowledge. The lab scrutinizes how newspapers and broadcast outlets are adapting to the changed environment, while also paying attention to the new generation of “online natives” with “different business models, and in many cases more sustainable business models,” Benton says. Such natives are news operations that began online, like ProPublica, the Pulitzer Prize-winning news site; other examples include political sites like Talking Points Memo and Politico—which has a print component but was online from the start. Whatever the imagery, structural dislocation clearly prevails, and in Benton’s estimate, a theorist of business disruption, Cizik professor of business administration Clayton Christensen, is “probably the most influential thinker about business issues in this media world.” References to Christensen’s ideas frequently turn up in the lab’s reports; his biggest single impact on the media field was Newspaper Next, a report that the American Press Institute paid him and his consulting firm to produce in 2006.